Why Choose Bluewater Plumbing, Heating, and Air Conditioning? Each of our technicians have over 10 years of experience working in New York. We only hire the best plumbers, heating contractor, and air conditioning service technicians in the area. From the time we answer the phone to the time we complete the service call, you will discover what courteous and highly trained personnel sign on with us. Try us and you will see. We show up on-time. Your time is precious and valuable. Don’t waste it with NYC plumbers who don’t respect it. If we run into a problem, we make sure we call ahead and let you know. 24 Hour Emergency Service - Most plumbing needs are emergency or near emergency. The experience and depth of the Bluewater Plumbing service offering means that while it may be an emergency to you, your plumbing problem is surely NOT new to us and whatever it may be, we have faced it before and know how to fix it immediately. Our trucks, are rolling warehouses, and contain everything we need so we can do the job right the first time! Whether you need a plumbing repair, a plumbing upgrade, or just need an emergency plumber, each of our trucks are fully stocked to handle any plumbing or heating emergency. Excellent Customer Service - We take the time to explain what needs to be done before we recommend your next course of action. Bluewater Plumbing, Heating, and Air Conditioning listens to your concerns, and we answer all your questions. Because we respect your home, our service technicians leave the area as clean as they found it. Our company is also involved in the community, taking care of the plumbing and HVAC needs of home and business owners throughout New York. From Bill's Bar & Burger Hits in Downtown Manhattan to installing and repairing plumbing, heating and air conditioning systems in large residential areas all over town, our team is ready to tackle any project, large or small. 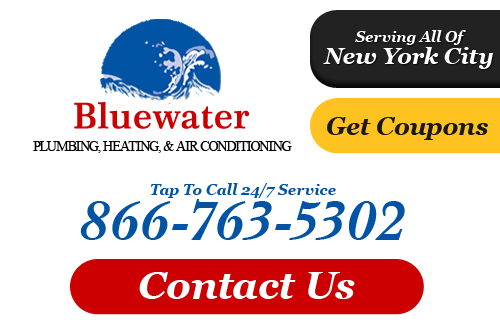 If you are looking for a reliable plumber in Queens, NY or nearby, call Bluewater Plumbing, Heating, and Air Conditioning at 866-763-5302 or complete our online request form.